using the smartest and most reliable solutions to fulfil your needs. 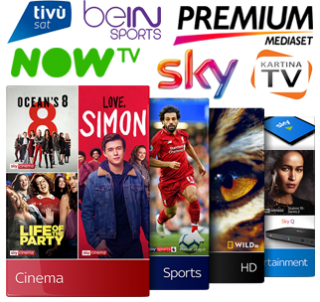 TV & Radio channels distribution services, both via satellite and Internet. Encoding services for OTT & multiscreen PlayOut systems. Occasional Use with SD/HD/4K SNG trucks in Italy and in Europe. Connectivity, Hosting and Co-Location, Netinsat provides turnkey solutions to connect your studio or local POP to satellite uplink facilities and hosts single devices to full transmission systems. Satellite coverages in Europe, North Africa, Middle East and South West Asia. Television is the core of entertainment systems in an hotel or on a mega yacht, Netinsat offers the best Pay TV packages, Italian and international. International languages: English, Russian, Arabic and many other. Highly specialized IPTV solutions as live streaming over VSAT for the maritime market or over 150 TV channels per room in the hospitality. Netinsat’s solutions have always special focus on the user interfaces in order to combine an attractive design and an effective user experience. Professional custom-configured media server able to deliver movies and music at the highest quality.